Choose the best online parenting class for you. The complete online parenting course for moms and dads of children 5-12. Learn the fundamentals essential for the most important job of your life; raising confident, happy children. 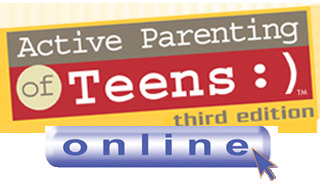 A comprehensive six session course for parents of teens and tweens. Gain the confidence and courage to meet the challenges (and savor the joys) of your children's teen years. A 4-6 hour online co-parenting seminar for divorced or separating parents. Learn the five steps to healthy co-parenting during this challenging time. A course combining Active Parenting principles with the wisdom of the Bible. Achieve a fuller, more satisfying family life as you raise children of joy, character, and faith. For parents of children ages 5-12. It's one of the most important jobs in our lives: raising children. Make it easier with Active Parenting's respected parenting classes and popular parenting books. Even if you don't have time to take a parenting class outside of your home, Active Parenting brings the lessons to you with these unique, video-based online parenting classes. Each class is based on sound Adlerian psychology and is filled with video, activities, and opportunities for discussion. A better-parenting certificate is available upon successful completion of the final class quiz. Worried about how online parenting classes work or are structured? Rest assured that you will receive quality instruction and parenting help from a certified Active Parenting Online Leader. These educators are screened, tested and evaluated by Active Parenting staff members before receiving additional training on facilitating an online parenting class. In short, we truly believe that you will be a more confident parent after reviewing our programs. You will receive access to the online resources, course-work, and videos, plus a Parent's Guide, and the ability to discuss parenting with other adults around the country—all in one parenting class at the low cost of $79.95. It's a small price to pay for a priceless learning experience. Note: This online parenting course requires Microsoft Internet Explorer or Edge, Mozilla Firefox, or Google Chrome. As explained above, the cost of the course is $79.95. Payment is accepted using MasterCard, Visa, Discover, or American Express. You will be notified by email of your class enrollment key and URL within 2 business days.